For more than 35 years, criminal justice faculty member Rolando del Carmen has been respected by his students for his commitment to mentor them during their time at Sam Houston State University, continuing with his support even after they graduated. The Academy of Criminal Justice Sciences formally recognized that dedication when it recently presented del Carmen a 2010 Outstanding Mentor Award during the organization’s annual conference in San Diego recently. 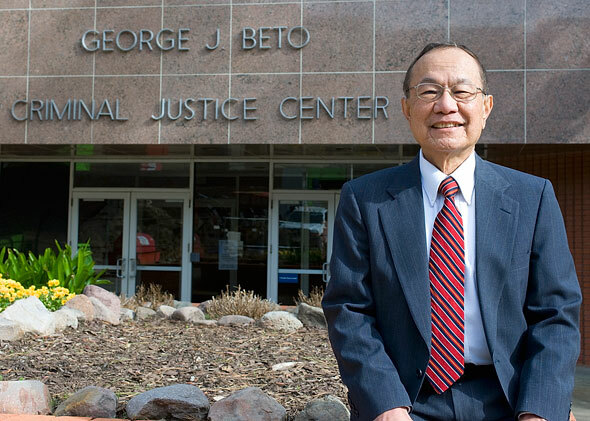 A Regents’ Professor within the Texas State University System and Distinguished Professor of Criminal Justice at SHSU, del Carmen is considered one of the nation’s leading experts on criminal justice law and has been honored in numerous justice arenas as being among the top in his field with productivity and quality of work. This is not the first time ACJS has honored del Carmen. He is the only individual in the academy’s history to have received the organization’s top three honors — the Fellow Award (1990), the Bruce Smith Sr. Award (1997), and the Founder’s Award (2005). One of his former students who is now a colleague spoke about how del Carmen had provided direction for her in several capacities. “He has been an outstanding mentor for me as a student, faculty member and administrator in the College of Criminal Justice at SHSU over the past 20 years,” said Janet L. Mullings, professor, associate dean and chair of faculty. “To be known as a ‘del Carmen student’ is a badge of honor both within the College of Criminal Justice and in (the field of) criminal justice,” wrote Craig Hemmens, who is now a professor in the department of criminal justice and the director of the honors college at Boise State University in Idaho. “Professor del Carmen’s mentorship skills are extraordinary because of all that they encompass,” he said. “He shows students how to write for publication, which is of course essential to success as an academic, but this is the least of his mentoring. Another former student, Katherine Bennett, now a professor in the department of criminal justice, social and political science at Armstrong Atlantic State University in Savannah, Ga., wrote, “Many of Dr. del Carmen’s former students are making significant contributions in their own right. Many have extensive records of scholarly publications, are department heads or associate deans in various universities, and hold leadership positions in professional organizations. “Dr. del Carmen is a person of humility and kindness and would not acknowledge this, but I firmly believe that their successes are due in large part to his tutelage,” she wrote. “He is a true scholar who has pioneered an entire area of research in criminal justice,” wrote Michael S. Vaughn, professor of criminal justice, assistant dean for graduate studies and director of the criminal justice doctoral program at Sam Houston State University. “On the basis of his many accomplishments, it is difficult to adequately describe his total contribution to the criminal justice community — his unwavering devotion to teaching, his eternal positive attitude, his unrelenting work-ethic, his ability to find consensus among colleagues, his efforts to make arcane legal doctrine accessible to practitioners, and the way he has shaped the careers of countless students who have gone on to become leaders in the discipline,” he wrote. “As much as he is a legendary scholar and professor, perhaps most important is that he is a good and decent human being,” wrote Chad R. Trulson, associate professor of criminal justice at the University of North Texas in Denton. Del Carmen explained why he felt mentoring was so important. “I try to help students in every possible way with the emphasis on academics,” he said. “I want them to be ‘the best they can be’ both in and outside the classroom. “Here at the Criminal Justice Center, the emphasis is on scholarly publications, so I try to help the students as much as I can write articles that are publishable in national journals,” he continued. Del Carmen also acknowledged the contributions made by his colleagues at SHSU. “Our students have been very grateful over the years for the efforts of our criminal justice faculty,” he said. “The award given to me at ACJS is only symbolic of what the faculty in the College of Criminal Justice at Sam Houston State University have done over the years,” he said. “I just happened to be the one who got it this year. “However, many of the other faculty members in the program are just as deserving, if not more deserving of this award,” he said.